We started with LEGO notes and now we are on to our second set of notes. 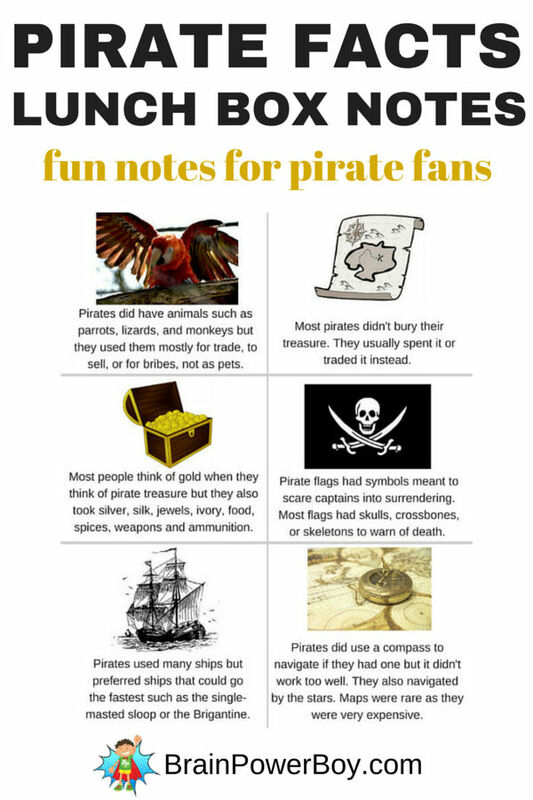 I went with pirates as they go well with a lot of other things we have on the site such as our Homeschool Unit Study: Pirates and the boys I know have all gone through a pirate phase. Pirate Facts Lunch Box Notes have some interesting facts about pirates. There are a lot of myths surrounding pirates and I tried to find info to dispel some myths as well as provide some neat tidbits about pirates and their lives. Once again these are a free printable because I like free and I like to make them for you and your kids. I know you appreciate the printables here on our site so I thought these would be fun. The information on these notes is super fun to share with friends and family! Did you know that buried treasure is mostly a myth? Carefully cut apart on the lines. This is what I use, and yes, I am in love with this paper cutter. Pop one in a kid’s lunch box or set it beside their lunch at home. They are a hit! Check out the nifty pirate lunch gear. Click on the picture to view. I found a lunchbox, cookie cutters and a freezer pack – sweet! For more notes like these Pirate Facts Lunch Box Notes see these LEGO Facts Lunch Box Notes. If you are looking for more Pirate Awesomeness, we’ve got it! What a great ideas! How fun! Thanks for sharing on the Thoughtful Spot Blog Hop! Thanks Alison! I’m glad you enjoy the lunch box notes. lol Emma 🙂 Well, I did have to look up a few things to verify that I had them right but overall this is all stuff a boymom knows! I love these lunch box notes! Great idea to add facts to them, I can’t wait to try this when my girls get older. If they aren’t into pirates, it inspires me to make my own, but if they are into pirates, I’ll have this saved! Thanks Jennifer. We like to do things with a fun learning twist here so these seemed to fit. Thanks for saving it for future use. These will be great for leading up to ‘Talk Like a Pirate Day’! Thanks for creating and sharing them. I agree – glad you like them. Thanks for taking the time to leave a comment and for your nice note 🙂 It was our pleasure to make & share them.